Jim Wood writes this letter to the Edmonton Journal, pointing out that it is not safe to ship oil by rail. He writes that if more pipelines are not built, more oil will be shipped by rail and that could be disastrous. 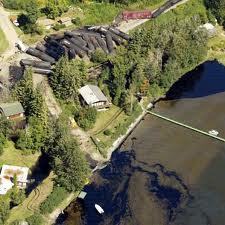 Wood refers to the 2005 derailment of a Canadian National Railway train that spilled 1.3 million litres of heavy bunker fuel oil and 700,000 litres of Imperial Pole Treating Oil into Wabamun Lake, west of Edmonton. Many fish and birds were killed and the lake shoreline still hasn’t fully recovered. The spill made the international news. See this Wikipedia link for more details on the Wabamun CN spill. Geez, get a life, transporting it by rail makes more sense than a thousand transports on the highway. We have been shipping oil, natural gas, ethanol and other similar products by rail for many many years and the world has not ended. 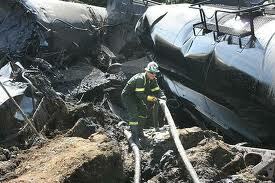 There are more oil spills by ships and pipeline breaks than by rail but I don’t see you going after them. There is a danger in transporting anything but shipping these products by rail is the safest way to go. “Get a life?”- I think it’s more a case of “get a grip,” Mr. Pfefferle. It seems that the view from inside Ontario Southland Railways remains myopic as usual. If rail provides such a safe haven for transport, then why are there so many ongoing reports about derailments, and why were the Federal Government’s findings after conducting its most recent review of rail practices as part of the changes made to the Railway Safety Act, so completely scathing? Time to get out more, Mr. Pfefferle.